I thought we start off on a profound note. It is interesting that nature has been around for millions of years before humankind appeared on the planet, and it will be around for millions of years after we have destroyed ourselves / left the planet so surely there are one or two lessons that can be learnt. I went to Wetherspoons again for breakfast today. A full English breakfast and bottomless cup of coffee or tea costs £4.70 which is not robbery in anyone’s language and the food arrives lightning quick. I’m accustomed to see a man sitting in a certain seat. He buys two newspapers and always has a pint of beer but to hand. I discovered him sitting in a different seat and asked him in my normal jovial manner why he had changed seats. He told me that someone had had the temerity to sit in his seat and I said that he should have a special permanent reserved sign because he’s there so often, I think every day actually. Two posters drew my attention on this rather rainy morning. I have featured over the months sample photographs for making volunteering attractive. This one is to work in a charity shop for Dorothy House, a local charity of great repute. 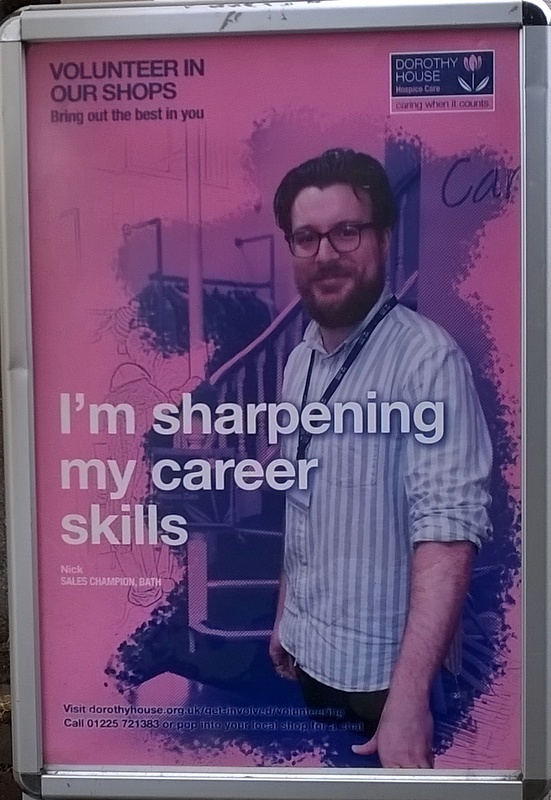 They have solved it by highlighting how you can sharpen your skills which could eventually be used for something else – or so the implication goes. This is sad. It is very difficult to make money unless you are in a very good position in the high Street. This one took over from another shop. This looks like a legal notice but it is not, because it is undated. The top one says that there will be redecoration and grand reopening. The second one says that the Establishment is closed. We have about eight charity shops in the high Street. I must count them when I next go. So long as we have the banks, Lidl, Sainsbury’s and a sprinkling of takeaway restaurants, two bakers we will survive. Two banks have closed in recent times. We have only lost one cash machine. The Post Office has located into a smaller unit so I think that is fairly safe. One or two pubs are struggling but then some would say that there are more than enough of them and what’s with Brexit and so on people are thinking twice about spending their money. This evening I’m going to Bradford – on – Avon to give a brief talk on 5G. A local doctor, Dr Tressider, Mark Steele (Campaigner against 5G) and myself will be speaking. I guess that by the time I get back at 11 o’clock this evening I will be too tired to write a diary so that will have to wait until tomorrow. You never know what adrenaline does, however.